Sondor Travel has been offering walking tours to Albania, Kosovo and Montenegro since 1991. Our wide range of trips includes products such as: Peaks of the Balkans, Valbona Valley, Theth Valley, Gashi River, etc. What differentiates us from the rest is the fact that we are born and raised in the Albanian Alps. This has helped us create a network of guides, assistant guides and walking routes who are the best you can find in the region. Our assistant guides are locals and previously shepherds who know their mountains by heart, competent to make your walking a unique and authentic experience. In most our walking tours in Albania, Kosovo and Montenegro we use local accommodation, alpine pasture huts, and family running guesthouses. For us it is very important to give you a unique walking experience done in an authentic way. Sometimes it can be a great insight into the local nature, mountain geology, bird life; sometimes it can be an activity such as collecting blueberries, mountain tea, sheep herding and sometimes just being a guest into the local families, knowing their living, beliefs, stories, enjoying the traditional food prepared for us. Explore the breathtaking landscapes of Albania and Kosovo on foot. This trip will take you through some of the most breathtaking landscapes of these two countries. You will hike their highest mountains, take a ferry ride along beautiful Koman Lake, and zip-line over the Rugova River. You will end each day's adventure by meeting the locals and enjoying the wonderful food they have to offer. Walk and eat your way through the Albanian countryside. This tour is a great introduction to the culinary traditions of Northern Albania and the amazing mountain landscape of the Albanian Alps. The tour offers great scenery of high mountains, green valleys, canyons and fresh air. Experience the true Albanian hospitality of guesthouses and enjoy delicious fresh food from local farms. 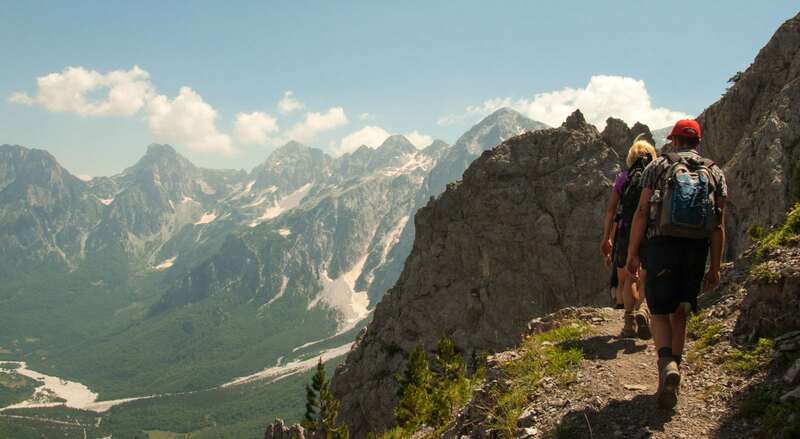 Walk the highlands of northern Albania. This tour combines walking with cultural discovery so you can experience the best of Albania’s nature and culture. It will immerse you in the local traditions of Albania's highlands as we walk through the National Parks of Valbona and Theth. The walks are of moderate difficulty so the tour is great for many travelers.